Nursing students gathered ar Westminster last month to demand more money for education. More than two thirds of the public believe there are not enough nurses to keep patients safe, a new poll reveals. The online survey, conducted by YouGov for the RCN, shows that 71% of the 1,692 UK respondents believe nursing vacancies are compromising patient safety. This result follows workforce data released by NHS Improvement last week, which show there are 40,877 nursing vacancies in England alone. More than half of the RCN poll respondents backed the college’s call for increased financial support for nursing students. A total of 53% said the government should spend some of the extra £20 billion a year promised to the NHS in England on supporting nursing students. This echoes last month’s gathering of nursing students in Westminster, where they demanded that MPs back the RCN’s Fund Our Future campaign. The college’s initiative aims to secure £1 billion a year from the government to support nursing education. RCN acting general secretary Dame Donna Kinnair said MPs and ministers should take heed of the poll results. ‘Taxpayers have spoken on how their money should be spent – politicians and NHS leaders would be ill-advised to ignore more than half of their voters and patients,’ she said. The college has presented costed proposals to the government, such as a maintenance grant for all nursing students and practical support for tuition fees, which includes bringing back the bursary or introducing ‘forgivable loans’ – loans paid back by the government in return for years of nursing service. 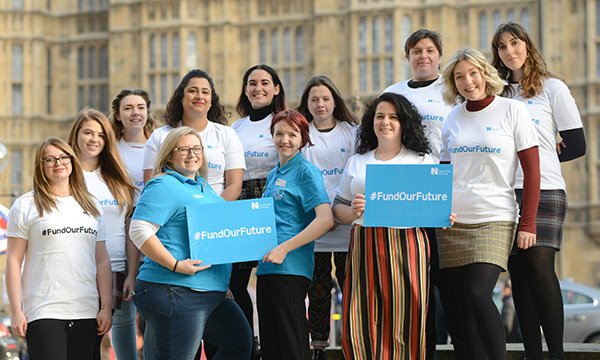 Following last month’s student lobbying event, health minister Stephen Hammond pledged that he and health and social care secretary Matt Hancock would write to the RCN regarding the issue of student funding.